The majority of people today suffer from stress. As it is defined in Oxford English Dictionary, stress is a condition or adverse circumstance that disturbs, or is likely to disturb, the normal physiological or psychological functioning of an individual. Considering the great number of people affected by stress, it is no wonder that many scientists deal with it. Hans Selye, one of the most prominent researchers of stress, defines it as a demand for adjustment made by the environment on the organism. Therefore, we can talk about stress as a combination of physiological and psychological disorders induced by an aggression on an organism, as an organism's reaction, its defensive preparation, and a likely onset of a series of illnesses. Stress affects bees as well as humans. However, we have to keep in mind the bee's size and the man-caused stress it has to endure. When this factor is taken into consideration, it is no wonder that modern apiculture is taking more interest in veterinary problems. By taming bees, as well as other animals, man has imposed on them a stressful way of life. Animals respond to it the best they can and as a result become more susceptible to ailments. Starting with Hans Selye's definition of stress, we can easily notice that the aggressive disorders from the bees' environment are mainly caused by breeders. The majority of the breeders are convinced that the man-made hive is the best habitat for bees to live in. Various types of hives suit the breeders' need to work comfortably and speedily and are adapted to provide optimal living conditions of a bee swarm. Where does, then, the stress come from, when everything is done so the bees are as comfortable as possible? The artificial habitat, the manufactured hive, only seems like the natural one. The microclimate that can be created in such a small space is far from optimal. The interior is in most cases hermetically insulated with waterproof layers of paint with which it is protected. It is difficult to create a climate appropriate for the bees, especially if the hive is not properly ventilated. The deforming of honeycombs in hot weather, mold growing in the hive and the development of a limy brood because of the moisture that cannot be removed, paraffin honeycomb-foundations, which the honeycombs have to be built on, are made by breeders and are often rich in residue of various preparations, all that plus a myriad of other conditions known to bee-breeders causes a cumulative trauma disorder (or occupational overuse syndrome) in bees. The notion of cumulative trauma disorder (CTD) in intensive agricultural production has been known since 30 years, and it includes ailments and physical injuries in industrial conditions of animal-keeping. In the area of apicultural technology, CTD is defined as physical injuries to bees or ailments that are caused by constructional errors or functional disorders on any technical system used in the process of rearing and utilization of bees. The hive and its construction are only one of the causes. 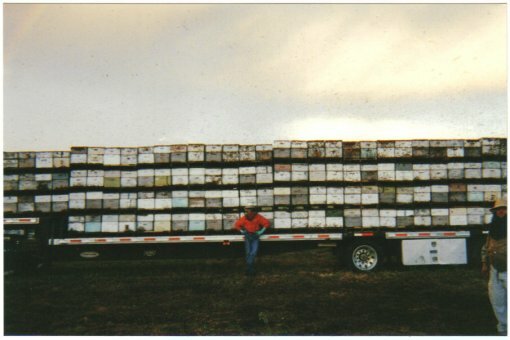 We all know how impressive the huge truck trailers which travel across the american continent look, or big buses populated by hundreds of bee communities, and such "structures" can be found even in these parts. Is it natural for bees to be so crowded? It is of course easier for the breeders to move their bees in this way, but how is it for the bees? Let us concentrate on the basic postulate on which modern apiculture is based – the moving of bee communities. Transporting by itself, no matter how short the distance might be, is a source of tremendous stress for the bee community. This peaceful insect has to endure horrible vibrations, sudden movements and blows on sometimes very long journeys. When it comes to food, let us also mention the stress caused by every product introduced to a hive for treatment. The invasion of varroa mites was the cause for application of hundreds of (registered) chemical products. The very unpleasant smell of fluvalinate (a pesticide known for the fact that the mites had become resistent to it), the filling of the hive with acid fumes, the suffocating smoke of burnt amitraz (a pesticide which is with good reason believed to be cancerogenous), are the inconveniences, which the bee had to withstand several times during the year. The treatment of crops with pesticides can be deadly to bees. For example, Imidacloprid (sold under various names like Merit, Admire, Gaucho, etc. ), a seed applied insecticide diffuses in the plant vascular system. It enters a bee's body via pollen. Additional stress to the bees is a curious breeder who frequently opens the hive, using the smoker to a great extent.